1. Heat 1 tbsp of the oil in a frying pan. Add the halloumi and courgettes and fry over a moderate heat for 8-10 minutes until turning golden. Lift out onto a plate with a slotted spoon. 2. Add the remaining oil and the onion to the pan and fry for 5 minutes, stirring frequently. Stir in the cumin and rice and cook, stirring for 1 minute. 3. Add the stock and bring to a gentle simmer. Reduce the heat to its lowest setting and cook for about 30 minutes until the rice is tender and all the liquid has been absorbed, stirring frequently. Towards the end of the cooking time, pack the rice down flat with the back of the spoon so it plumps up evenly. If the mixture is dry before the rice is cooked, stir in a little hot water, but make sure all the water has cooked off so the rice is almost sticky. Stir in the halloumi and courgettes and heat through. 4. While cooking, mix together the yogurt, garlic and mint and place in a serving bowl. 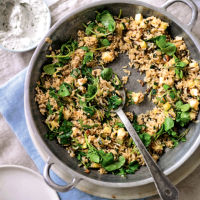 Stir the watercress into the cooked rice until slightly wilted and serve with the yogurt.